In January 2009, on my third full day in Medellín, I took the metrocable from the San Javier metro station to La Aurora in Comuna 13. The metrocable to La Aurora was new at the time, having just opened the year before. There wasn’t much to see at the top, aside from a distant view of the city, so after asking a police officer to take my photo, I went back down. It was only later that I learned Comuna 13 was the most dangerous district in Medellín, plagued by a recent history of violence at the hands of guerrillas, paramilitary groups, drug cartels and local gangs. I would take the metrocable to La Aurora on only one other occasion, a month or two later, to visit a Colombian Couchsurfing friend who lived nearby. And the only other time I’ve gone to San Javier since 2009 was to celebrate New Year’s Eve at the end of 2012. According to 2005 statistics, Comuna 13 is home to a little over 134,000 people, 65 percent of whom are 39 years of age or younger. In addition to being a younger population, Comuna 13 is also predominantly in the lower economic strata (on a scale of 1 to 6). San Javier is mostly residential, occupying a hilly area at the western edge of the city. It is one of the most densely populated areas of the city. In the last 15 to 20 years, Comuna 13 has been an epicenter of violence and struggle for criminal control within the Medellín valley. As a result, residents of all ages have been caught in the crossfire, and forcibly displaced from their homes. It has long been an area of strategic importance to guerrilla and paramilitary groups, as well as gangs looking to control the San Juan Highway leading west out of the city (and north to the Caribbean coast). Control the highway, and you control the illegal goods flowing in and out of Medellín, and much of Colombia. On October 16, 2002 the Colombian military launched the controversial Operation Orion to remove left-wing rebels from the area. While successful in that regard, their presence was almost immediately replaced by a paramilitary group lead by “Don Berna,” an heir of Pablo Escobar. In 2010, more than 10 percent of the city’s 2,019 homicides occurred there. On September 21, 2010, Juanes, a Grammy-winning singer and Medellín native, organized a free concert to promote peace in Comuna 13. He was joined by J Balvin, Jowell & Randy and other artists. The violence also lead local hip hop artists to begin speaking out, with unfortunately sad and tragic consequences. In trying to save their communities through their words, music and art, they drew the wrath of the gangs, with no less than 10 hip hop artists murdered since 2009. Dozens more were forced to flee their homes. There’s still little reason for tourists to visit Comuna 13 outside of a ride on the metrocable, or to see the new outdoor escalator. Both were established to improve residents’ access to the city, and have contributed to the Medellín’s international acclaim for urban renewal. The metrocable is easily accessed from the San Javier metro station, at no additional cost. If you get out of the metrocable at La Aurora, you’ll be treated to some nice views of the city, but you’ll also then need to buy a return metro ticket. A series of six covered escalators rising 400 meters up a very steep residential neighborhood seem to be a big deal, but it’s hardly the first time escalators have been used in this way. In the mid 1990s, the 800-meter Mid-Levels Escalator was constructed on Hong Kong Island to serve a similar purpose. The escalators can be accessed visa a short bus ride from the San Javier metro station. I haven’t felt the need to visit them myself, but I know several bloggers who’ve made the trip, and lots of foreigners were checking them out during the 2014 World Urban Forum. I’m told the area immediately around the San Javier metro station is generally safe, as is taking a ride on the metrocable to/from La Aurora. I’m less sure about the escalators, though like the metro, there are plenty of police stationed around them. I recommend visiting during the day, and preferably with at least one other person (Colombian if possible). This is not an area you want to be around once the sun goes down. While you probably will not run into any problems, it’s safe to say as a foreigner in this part of the city, you will be noticed. If you want to take photos, do so subtlety. Don’t walk around like this guy shooting video stating you’re in the most dangerous part of the city over and over again. 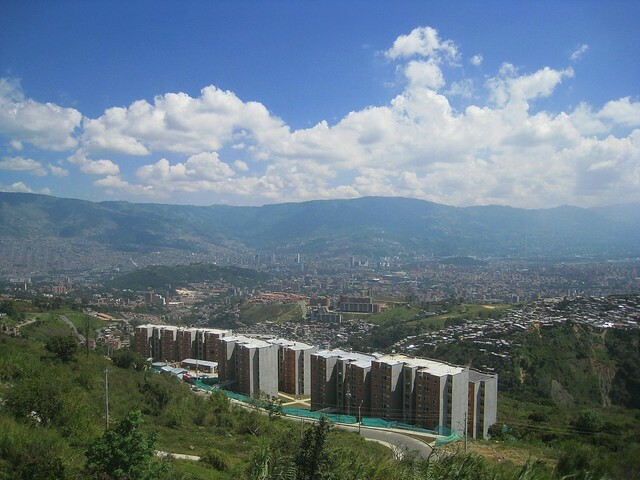 Use discount code MLTOURS when booking your tour of Comuna 13 online with Medellín City Services and save 20 percent! If booking by phone or email, you can mention it as well. With the Urabenos merging recently with La Oficina and taking control of the city, order has been more or less restored and things are calmer. Foreigners are generally left alone but obviously caution still needs to be applied and drunken fools can expect to be relieved of their valuables. Yes, with those groups purposefully trying to quiet things down in 2013, Centro (downtown) ended the year with a higher homicide rate than Comuna 13. Danny boy, understandable for novices to get their knickers in a knot. I’ve lived in Colombia for over a decade and never had a problem. And that includes encountering the FARC on my very first day in the south of the country, standing on the wrong side of the bar reserved for gold-dripping narcos and walking down Av19 in Bogota at 5am looking for taxi. All that’s required is politeness, respect and a bit of street smarts. I have to reply using the words of Mark Twain…My life has been full of catastrophies… some of which actually happened! Keyword, respect. It’s extremely important to show it here. So in about 8 years Comuna 13 added almost no population and the average Estrato has dropped in that time with there now being fewer households in Estrato 3 in Comuna 13 . The average Estrato in Comuna 13 is 1.96 and Comuna 13 has frequently been cited as one of the most violent neighborhoods in Medellín so not really a place for tourists. Who are the 5% of idiots paying strata 4 costs to live in that area? Usually the ones that run the muscle for the barrio. These are the people that supposedly will protect your businesses and community from outside agitators or extortions. Almost all the hoods in Medellin and Cali have these smaller “Godfather” figures. The cops don’t usually bother them because they get their regular kickback. I got the statistics from the Wikipedia page, and specifically noted the year for them because I realize they were older. But honestly, the difference in percentages the last 8 years is negligible in my opinion. Thanks for providing last year’s stats. Sounds like a good yet difficult place for renewal. Press on with that. I didn’t quite follow how the elevators are used. Help me out here David. What are they for? Escalators? Most of San Javier is built on steep hill and mountainsides. There are some gigantic staircases as a result, which can be exhausting to walk up and down every day. The escalators are meant to help ease the difficulty of moving up and down the neighborhood where they’re located. Keep up the good work! I’m going to link to your post if you don’t mind. I just went to comuna 13 recently, up with the metro cable, which – so I agree – is not that exciting and also to the escalators. I went there on my own and I didn’t feel unsafe. I found it really interesting, there are guides at the escalators who tell you about the history of the neighborhood and there is graffiti art everywhere. I had lunch and later some homemade ice cream there at comuna and walked around a bit. No one stared at me or even seemed to notice me. Although I would not recommend to go there after dark, walk around flashing your expensive phone or taking pictures with your expensive camera, but I thinks that’s obvious. I liked the neighborhood it and I would recommend to go and check it out. What makes it interesting, is that it is so different from “the other, glamorous part” of Medellin, it has it’s own cool flair. We are in our 60’s and grew up in NYC. We were in Comina 13 today. We had to take a bus because the cable line J was closed for maintenance. The area was pleasant, music playing, people cleaning and a general pride of ownership was noted. The houses were colorful, and artistic graffiti was abundant. We felt safe and never intimidated. However, due to the narrow and winding streets through the neighborhood, I would not feel comfortable here at night. I just did this yesterday. In case someone wants to go without a tour, take Metro to the San Javier station. When you exit the station, turn right and go slighly down that side street where all the green buses are parked. Look at the windshield that has route number 225i (20 de Julio will be on the destination card). The fare is currently 1.000 pesos. Before you give the driver your money, just ask “escaleras mechanicas”, and he should say yes. Since he realizes you are tourists, he will probably tell you where to get off the bus. It’s helpful to have GPS running on your phone, and get off near the corner of Calle 38 and Carrera 110. When you get off the bus, you’ll turn left and walk up the long uphill street and you will eventally see the escalators. If you are not sure, just ask someone “escaleras mechanicas?” and they will point the way. There are plenty of other tourists that come up here, so people are used to having foreigners going to ride the escalators. Believe me, you will not be the only foreigners do this, so don’t be afraid. I did not have any fear at all, and there are employees dressed in red vests at every platform of the escalators to observe what’s going on. Have fun…. recommended!